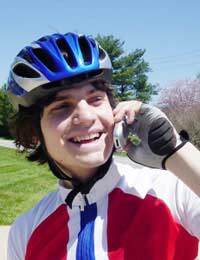 Can I use a Mobile While Cycling? Home > Regulations and Law > Can I use a Mobile While Cycling? If using a mobile phone while driving is against the law then does the same rule apply to cycling, as by doing so also presents a safety risk to yourself and other road users? Unlike with motor vehicles, few rules seem to apply to the cyclist; they are a law unto themselves. Cyclists riding drunk, without hands, wheeling other bikes alongside, with other passengers perched on the back, carry shopping on their handlebars are all not uncommon sights. The general rule seems to be if it is possible then do it. So it’s hardly surprising then that cyclists using a mobile phone while riding is a very common sight, and as such would barely raise an eyebrow. Just like with all these cycling bad habits, it isn’t advisable, as you are putting yourself and others at risk, but you are not breaking the law. If a member of the local constabulary spots you using a mobile phone while cycling then they may feel inclined to stop and caution you, but in places where biking is so commonplace and bad habits so widespread – such as bike-friendly European cities like Amsterdam, Berlin and Copenhagen – then it’s likely they’ll have better things to do. However, if you are seen to be cycling particularly carelessly or dangerously whilst using a mobile phone – such as on a busy main road – then you do put yourself at risk of prosecution by the police. Using a mobile phone whilst driving is unacceptable behaviour because it means you are not in full control of your vehicle, and so present a serious safety risk to yourself and other road users. Anybody that is seen doing so is seen as being utterly thoughtless and irresponsible. By rights the same attitude should apply to cycling phone users. A bicycle may be much smaller and slower than a car but it still has the potential to cause serious accidents. A fast moving bicycle travels with considerable force and with a long stopping distance, and can cause a fierce clash if it collides with a pedestrian. A teenage girl was killed in April 2007 in Buckingham, Bucks, when a careless speeding cyclist collided with her as she walked along the pavement. In such a position of responsibility, cyclists should therefore always give their full concentration to their actions. Perhaps it is difficult to disassociate cycling from mobile phones when competitors in the Tour de France, the most famous biking event in the world, wear jerseys advertising a mobile phone company. In keeping with the common practice of tying up sports with incongruous sponsors – such as Cadbury sponsoring the London 2012 Olympics and McDonald’s ties with the Football Association (FA) – it is interesting to note that telecommunications operator T-Mobile have maintained a business relationship with cycling since 1991, when they began sponsoring a high-profile cycling team. Of course, this is not to say that the company encourage use of their mobiles while cycling. As of 2007, the sponsorship has ceased, however not because of the growing concern about inappropriate and dangerous mobile-use, but because a stand against the succession of doping scandals that have ravaged the sport. What Happens If You Video a Cinema Film? What Are the International Laws on SIM Locking? Can Mobile Phones Be Used in Hospitals?